If you wear dentures or have been told you need them, you might be a candidate for implant retained dentures also known as overdentures. Implant retained dentures hold dentures in place more securely than traditional dentures. When your gums and jaw bone begin to shrink, even the best fitting dentures can start to shift around, causing pain and difficulty chewing. Implants are titanium alloy threaded posts that are surgically placed under the gums. They fuse to the bone of the jaw, acting like roots. 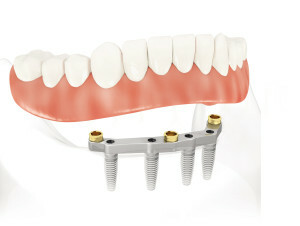 A denture can be attached to the implants to anchor it in place. No dentures are truly “permanent”, but Implant Dentures are as close to “permanent dentures” as possible. Patients who have implant retained dentures report greater confidence, more enjoyment of the foods they love. To find out if you are a candidate for implant-supported dentures contact our Toronto office to arrange a consultation.